This has to be a joke. Really? It's Friday already? That is absolutely Nuts! And I think I might be starting to sound like a bit of a broken record. Every week I'm dumbfounded by the calendar...asking you guys how it could be Friday already. I definitely deserve some eye rolls at this point...and I wouldn't fault any of you for throwing them my way. Earlier, right before I started gathering my Friday Favorites, I said to Aaron "Wait, it's Friday already?!" And he gave me a look like "really? you're shocked? Am I gonna have to hear this every week?" But it's the truth. The days of the week are running away like wild horses over the hills. Anyway, I guess that's the state of my life at this moment. But I'm not attaching any negativity to any of this. In fact...maybe it's a good thing. 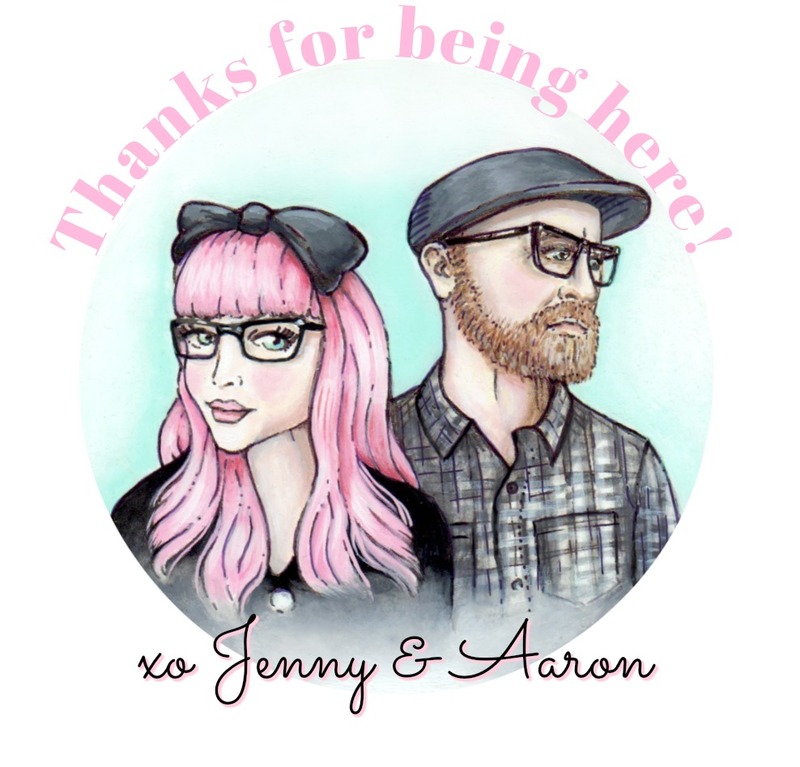 Because currently, Friday means it's the day after our Thursday Art Journaling with Jenny & Aaron class...which is something we are very excited about. So far, the response and turnout have been great. It's only week one and we've already got so many peeps getting creative right along side us. 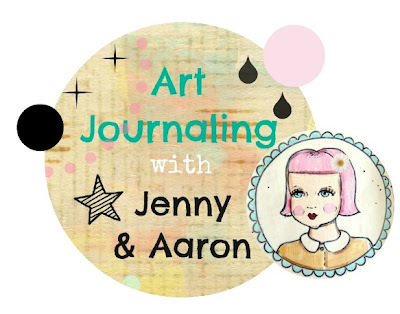 And speaking of...if you decide to do any Art Journaling this weekend, please do us the honor of blogging about it, and linking your blog up to yesterday's class post. There is so much more great stuff to come. So yeah, bring on next Thursday...I'm eagerly anticipating it's arrival. Ok, now for the Friday Favorites. The pic above is so fab and it features something I've been wanting to get for a while. 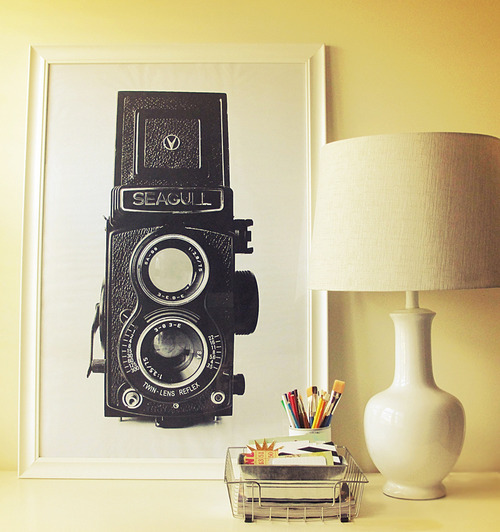 That framed camera is an Engineer's print, which can be purchased for under $5.00! Available at Staples, these oversized prints are so cheap because they aren't exactly premium quality. They come on very thin paper (comes on a roll) and even though it's low quality printing, it has it's own look. So many ideas in my head! And then the idea of mounting them...and embellishing could be amazing! This may just have to happen sooner than later. 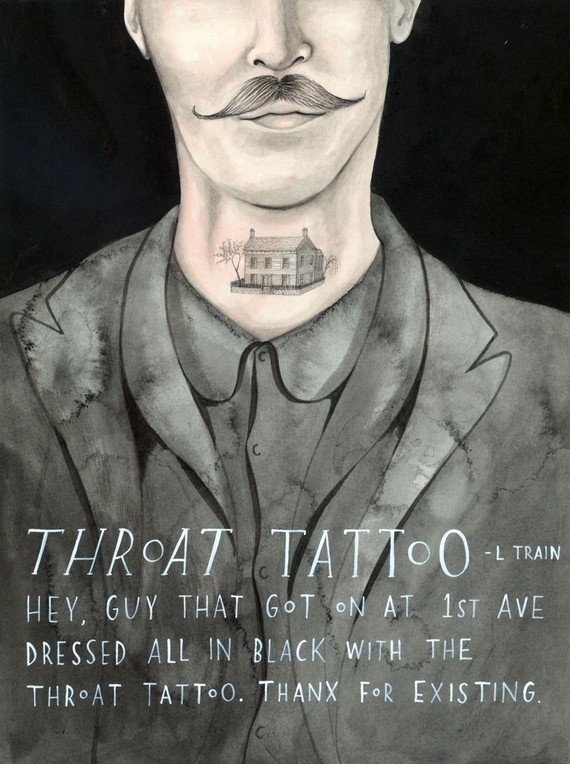 A print of an original illustration from the Missed Connections project by Sophie Blackall. I absolutely love when a great concept meets perfect execution. You have to check out her entire collection. Each painting just gets better and better. Now normally I'm a bit more on the vintagey side with only bits of mid century modern...but sometimes, I might not need all of my vintagey cottagey goodness. If done the right way, I can take an entire room that's streamlined. This kitchen is case in point. Just walk in, don't change a thing, start making pancakes. Ok, once again...I couldn't get through a Friday Favorites without some geo stuff. This tutorial is so so cool. 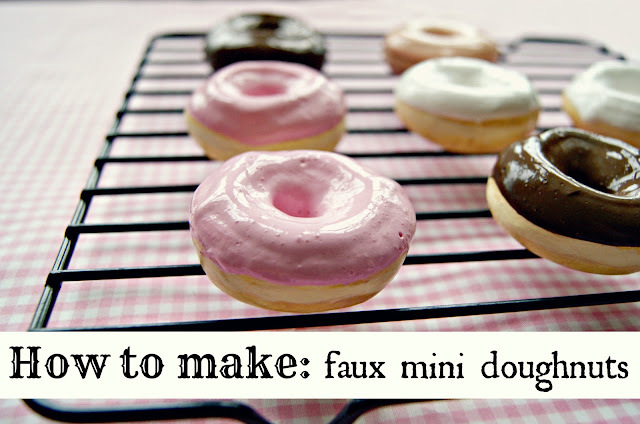 Yes, you can make this! 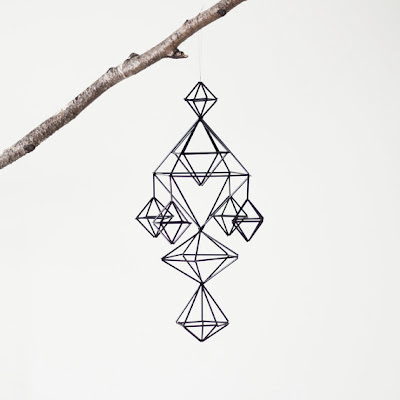 Made from coffee stir sticks, black string, and not much else. Wow. With Fall right around the corner I'm thinking of back to school shopping. And mind you, I haven't been a student for eons...and I don't have kids to school shop for. No, the idea of back to school shopping is just programmed into my brain. I kinda think it will stay that way forever. September means new clothes! 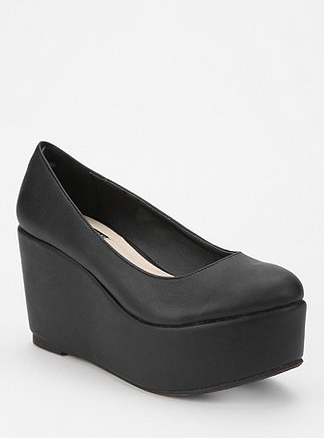 And I'm loving these wedge platforms. They will go perfectly with my First Day of School Outfit. Ok, another Fabulous Friday is here and I hope you've enjoyed taking a peek at my Faves. 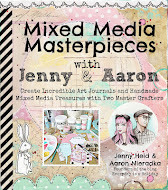 I look forward to seeing you next week and hopefully you'll check in on Thursday for some Art Journaling! 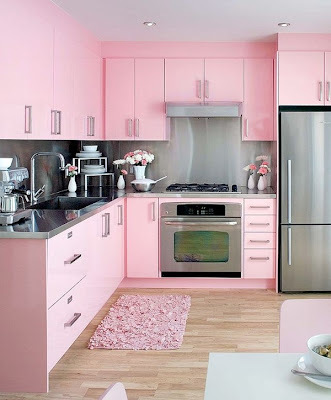 You are absolutely right about the pink kitchen; even though I'm not a fan of pink, this one is perfect. @Juanita Isn't it great?! yeah..not really what I normally go for...but wow..it's fantastic!! yes, I just LOVE that Missed Connections series! Back to school shopping forever. I'm really liking that concept! Have a great weekend! I loveeeeeeeeeee that camera print and the pink kitchen!!!! GORGEOUS!!! That kitchen is just awesome Jenny! Would love to wake up to a breakfast in that. And that geo mobile made out of coffee stir sticks?! That blew my mind, lol. No, but really. So cool! Yes, I DEFINITELY love that camera print! Oh man. I might have to turn my new kitchen into something like that... Jacob would probably have a heart attack! Haha. And I totally hear ya. Forget being confused that it's Friday already. I'm confused that it's AUGUST already. I'm thinking it still feels like it should be about February! Going to try my best to squeeze in a little time for art journaling this weekend!!! That kitchen is so perfect! Aah, I wish it was mine!